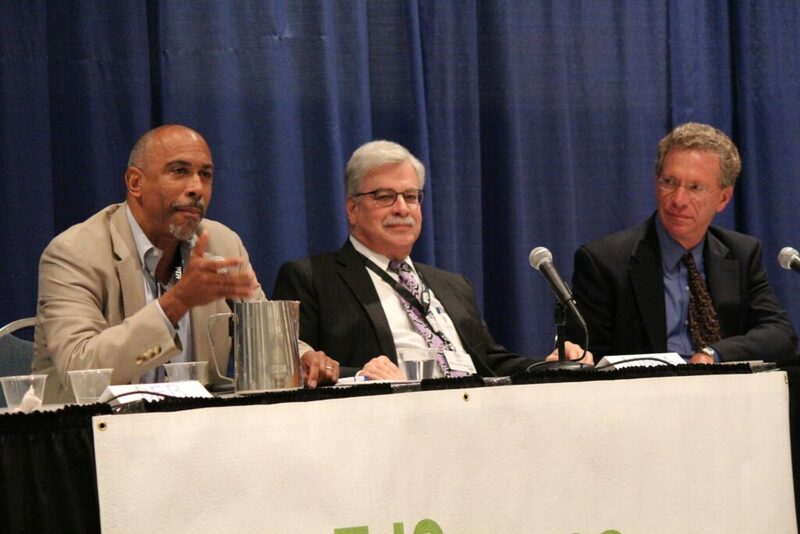 Pedro Noguera, left, USC Rossier School of Education Professor Lawrence Picus, center, and EdSource Executive Director Louis Freedberg during a discussion at the 2013 EdSource Symposium. Noguera, a professor of education at New York University, will give this year's keynote remarks. Rarely has one state attempted to make such sweeping changes to its K-12 education system as California is now doing. With the adoption of the Common Core standards, the transition to a new school funding formula and the shift from state to local control over spending, California is simultaneously changing what schools teach, how they are funded and how they’re governed. Whether these reforms together can dramatically improve education for disadvantaged minority and poor children – those identified as high-needs students – will be the focus of this year’s EdSource Symposium on April 30 in Sacramento. The event, offered in partnership with the California State PTA, will bring together top experts in their fields to discuss the promise of the reforms and successful strategies that already are evident. The first two panels will discuss how the Common Core can improve math, reading and writing skills of high-needs students and how new locally written budget and accountability plans can serve as a driver for change. The final panel will explore what other reforms are needed to close the opportunity gap, which experts define as the disparities in resources and expectations that contribute to higher dropout rates and lower test scores and college readiness of poor, Hispanic and African-American children. Pedro Noguera, author and professor of education at New York University, will kick off the symposium with reflections on what is working to narrow the opportunity gap. Mac Taylor, who provides policy advice to the Legislature in his role as legislative analyst, will present an update on the state budget. While it is too early to meaningfully measure the impact of the new academic standards and increased local control on high-needs students, the funding commitment to these students is real. The Local Control Funding Formula, which took effect last year, is directing substantially more money to school districts with large percentages of low-income children and English learners with the proviso that the funding be used to improve and expand services for these children. Superintendents and school boards must lay out how they will do this in Local Control and Accountability Plans, or LCAPs, which they are required to create in consultation with parents, teachers, students and community members. State Board of Education President Michael Kirst, who will participate in the symposium’s LCAP panel, said this process marks a distinct shift from budgets driven by state-mandated formulas to “school improvement through better resource allocation at the local level.” LCAPs require not only that school districts plan ahead but also that they look back each year to measure whether performance goals have been reached – and then make adjustments. “California’s equity funding formula represents a major breakthrough in the way states approach funding schools. However, if the state is going to increase college readiness among its most disadvantaged students… it will have to go further,” said Pedro Noguera, author and professor of education at New York University. Districts wrote their first LCAPs last year, under temporary regulations that the state board has modified. The initial reviews of some of the state’s nearly 1,000 districts were mixed. In some districts, parental voices did make an impact. Los Angeles Unified revised its draft LCAP to steer more money to 242 schools with the highest-need students based on a Student Need Index pushed by community groups. Participating with Kirst on the panel will be Santa Rosa City Schools Superintendent Socorro Shiels, who will talk about her district’s strategy for approaching the LCAP, as well as Ryan Smith, the executive director of Education Trust-West, a nonprofit that advocates for minority and poor children. In its evaluation of first-year LCAPs, Ed Trust-West found that many districts failed to provide enough budget data to document whether money allocated for high-needs students was spent on them. The report called on the state to require greater transparency in the plans. The state board adopted the Common Core standards in English and math in 2010. However, only during the last two years have many districts had money to begin to train teachers in the new standards and invest in new curriculum materials and the technology needed to administer the new Smarter Balanced online tests in the new standards. EdSource is following the implementation of the Common Core in six districts. In interviews, all of the superintendents said they were optimistic that the new standards will better prepare underserved students for college and careers. But they also acknowledged that the new standards, which demand higher verbal skills and the ability to analyze complex texts, will disproportionately challenge English learners. At least initially, the already large differences in test scores between low-income children and English learners on one end and white and Asian students on the other could grow. “We’re concerned that we’ll see a widening of the achievement gap if we’re not very proactive,” said Nicole Knight, executive director of the Oakland Unified School District’s new English Language Learner and Multilingual Achievement program, in a previous interview with EdSource. Garden Grove Unified Superintendent Gabriela Mafi, who will participate in the Common Core panel, said that new standards alone won’t improve achievement without a shift in how teachers teach and districts respond to change. “Just changing the standards without changing the way that teaching and learning happens in the classroom, without ensuring that you have a stable district and school site leadership and effective and motivated teachers, in and of itself isn’t going to make a great change,” she said in an EdSource interview. Noguera also believes that more rigorous standards and the state’s new funding system, steering more money to high-needs students, are important but not sufficient steps. Access to quality teachers, equitably distributed. California’s ambitious reforms approach the first two elements. Darling-Hammond and Noguera will remind those attending the symposium not to lose sight of the bigger picture. Opportunity gaps have always been there because of what is euphemistically called “socioeconomics,” but should be termed for what it truly is: poverty and xenophobia. As for LCFF directing more money to needy districts, I just don’t see the difference given that the total budget went up anyway. What is “transformational” is for the state to wash its hands of it all and simply task the districts with distributing the funds to the schools that need them most. LAUSD just released its 2015-16 LCAP together with what they call an “equity index.” After many many pages of high-falutin’ statements the bottom line is that roughly $220 million out of roughly $1 billion of Supplemental and Concentration grant funding will be spent on needy schools. Is this what Gov. Brown meant when he talked about “proportionality” and helping the poor, English learners and foster kids? BTW, the fact that West Ed found that districts were not forthcoming about their LCFF decisions is akin to Captain Renault being shocked about gambling taking place at the Café Américain. Didn’t Mr. Ryan learn anything while he was working hand in hand with Deasy’s supporters? So opportunity gap translates to zenophobia? Why fault Ryna Smith for pointing out what few others in the education pantheon have failed to say? How many article have you read on Ed Source about the wonders of the LCAP – a new era in education? At the very least he had the gumption to say what others refuse to out of disinterest or disrespect for community concerns and parent input. I commend him and you should too, especially since you were one of those google-eyed supporters, Manuel. Oh, Don, you can’t ever stop being a troll, can’t you? Ever talked to Ryan? He is an interesting fellow, always careful on what he says. So his statements as head of Ed Trust need to be seen in that light. I dare say he was very familiar with how schools get funded as he was very much involved with the LA School Partnership as one of their top employees. Then he moved on to United Way of Greater LA, which has been for some time a political organization and no longer an umbrella charity group. But you don’t know that, do you? You just jumped in because, well, because that’s who you are, always looking for attention. Anyway, the entire direction of Ed Trust was clear when they started to complain that LAUSD was not giving the LCAP money (really the Supplemental and Concentration grants) to the needy schools. They were not the principals but three other orgs pushed Deasy to give all that money to a selected set of schools they dubbed the “Aggregate Student Need Index” which received considerable attention here in EdSource. (No, I am not going to dig the links, you do it.) Deasy paid lip service to them and that was that. Consequently, all of these non-profits felt betrayed as they had worked to get LCFF passed and the funding streams had remained the same. Then Mr. Ryan was hired by Ed Trust and, naturally, he had to take the banner and say what he was expected to say: they got sold down the river and now they had to complain just as loudly as those of us who saw this as a pig-in-a-poke. Sure, I said that LCFF would be an opportunity to bring local accountability. But that’s all it was because there are no real teeth in it, courtesy of the SBoE. Governor Brown did a masterful job: he rearranged the way the funding streams are identified and then passed responsibility to districts to distribute them. No longer will the public be beseeching Sacramento on how the money should be spent (and he did away with a lot of possible pork). Now they have to deal with their own local Board and, if that fails, their County Office of Education. But that’s just not going to work as we saw with LACOE rejecting LAUSD’s LCAP for last year only to cave in later even though the ACLU raised a stink. Result: Meet the new boss, same as the old boss. Now we are in for round two (the first one never happened as last year was effectively the first year when an LCAP had to be turned in) and all kind of interesting stuff is buried at the link navigio provided. Yet, here you are, trolling again for attention and criticizing me for saying that the emperor has no clothes. Go bother the schools where your kids are in, will you? Manuel, my googled-eyed reference wasn’t intended as a put down, just a point of fact, unlike your comment. Sorry, if it hit a raw nerve. That wasn’t my intention. I’m more than a little disappointed as well in the sham of it all, the business as usual, though I have to say it was kind of obvious from the get-go, unless one is lining up into an ideological row. Well stated. When it comes to Ed Trust (Ryan Smith), as well as the rest of the school-criticism-industrial-complex, it is useful to keep in mind the “old” maxim, follow the money. When one does you find the usual suspects, the vulture philanthropists, putting dollars behind the agenda to distract the public most typically by scapegoating from the real issues of educational achievement. And it’s not “bad teachers,” seniority rights, or due process that is the cause, it is that these kids though their pay is very low go to work and contribute 20% of the household income in support of their families. It is the element of economic survival that causes the majority of dropouts. So, the dropout issue, is not central to schools anymore than achievement test scores are central to schools. As ETS has been asserting and doing study after study on tests they administer, 2/3rds of the differences in achievement test scores are related to family and community factors. Now the cynics and conservatives, or do I repeat myself, will jump in with a rant about how come we need to increase support to schools if families and communities are so important? This frames the question: Should we the, wealthiest nation on Earth (and CA the wealthiest state in that nation), better neglect children in their homes or in their schools? (Have you stopped beating your wife yet?). The real answer is we should not neglect them in either place: Child neglect is child neglect. The article quotes one of the researchers in the study: “The elephant in the room in conversations about dropouts…is poverty. If there is an economic element to the reasons folks drop out…then our interventions need to treat it like that.” Now “treating” conditions of poverty will take huge investments (in the order of a modern day Marshall Plan) with much of that going to communities of color. And it will take time to have an observable and positive outcome. I recall a longitudinal study done years ago that just gave money to families in poverty to bring them significantly above the poverty line. The achievement of the children involved increased only slightly. But, again it was a longitudinal study, the improvements in achievement to the children’s children were dramatic. Too often the focus is on only family incomes and immediate effects and not on family wealth that extends over time and that can have long term effects. The metaphor of the “elephant in the room” reminds of that TV ad on COPD that has an elephant sitting on a person’s chest and constricting their breathing. The evidence on the ill effects of poverty is so prevalent and so deep that this is a case of the elephant sitting on people’s heads and them purposefully ignoring it. And this is where the constant stream of press releases in the guise of “studies” coming from conservative and libertarian think tanks and their hired minions statements are focused: “Listen up public! Pay no attention to that elephant sitting on your head.” And, now we have lawsuits, funded by the same characters, added to the din of distractions. I think Noguera has it right. With LCFF, as flawed as the first year rollout may have been, CA has broken new ground in recognizing in statute that students living in poverty and struggling to master a new language require extra funding to the school districts that deal with them. That doesn’t change the fact that in CA it is just a more moral and equitable way of underfunding almost all the students. But it’s a moral and equitable step forward and it stares hard at that elephant. How dare Ryan Smith try to help poor black and Latino families advocate for their children’s education? Any effort to sit at the table by parties other than teachers and bureaucrats must be stopped at all costs. There can be no breach of the hegemonic powers of the status quo – no critics of education or child advocates who don’t toe the party line. For pointing out the problems that parents have in navigating the LCAP, Ryan Smith’s crusade must be stopped. Poverty comes in more than one form. There’s the poverty of station and then there’s the poverty of ideas. Education! What a concept! Don, you are not a very good satirist. When you try, you sound like a parody of yourself. BTW, the above is not meant for you, it is meant for the peanut gallery. You are a lost cause, in my opinion. But you keep poisoning the well, so every so often I must try to offer an antidote. True, there is not enough time in the world to do it, but gotta give it a shot once in a while because if not one of us, who? Gary, true, California now has an statute that says it costs more money to educate children with socioeconomic handicaps. The next step will be to recognize the same for students with disabilities. Why? Because even the LAO claims that it is a “duty” of the local districts. When often the entirety of the budget comes from Sacramento, how could they argue that? There are no true “local funds” (unless you are a basic aid district, but that’s another story). Would you believe that LAUSD has let it be known at a recent PAC (yes, the group that is supposed to be looking at the LCAP) that they intend to close all their special education centers and mainstream every single kid without migrating the resources to the local school? Can you imagine what this will do to instruction of the other kids? Can you imagine what it will do the learning of the special ed kids when all the “scaffolding” is taken away? I am glad I don’t have skin in the game, but this is going to be catastrophic if allowed to go forward. So, yes, the state needs to recognize that it needs to acknowledge that teaching children with disabilities costs even more money than teaching ELA and math to a poor child. If we don’t, that’s a cruel joke and we might as well abdicate that responsibility and throw those kids on the street. I cannot disagree with you. We have known all along the solid educational opportunity for the learning disabled costs more. That has been recognized since the inception of IDEA and, Congress recognizing that there were federal level civil rights issues involved, federal funds were directed at special education supports. The original legislation called for a federal support level, since they were based on federal civil rights mandates, of 40% of the costs. Congress in the interim has never authorized anything higher than 20% of the costs leaving programs to be mainly supported by state and district funding. (This is subject to interpretation of the original legislation which is somewhat murky in intent.) It is an expensive process, and what we at the local bargaining tables always noted as the greatest of the “encroachments” (mandated programs whose costs were greater than their funding streams). I cannot recall a local who, at the bargaining table, did not concede to the encroachments and fully fund perceived special education needs. The gradual dismantling of county level programs (at least in my county) began more than a decade ago with a small but growing group of teachers called “full inclusion teachers.” The rationale for this process, which meant shutting down county office run programs and sending the lids to their local district, was: 1) it was a civil rights based LRE (least restrictive environment) issue; and, 2) the needs of the students could be more effectively and efficiently ($$) met at the local level. All of this was kind of done by fiat, so it was not a district based decision. In retrospect I think rationale #2 really outweighed rationale #1. Full inclusion meant that, typically with an aide/and or teacher in tow, a special education student was placed in a regular education setting. All of these trends make for greater challenges for teachers, particularly in CA with some of the largest class sized in the nation to start with. I recall one class I had of around 32 students with five of them special ed and with differing IEPs (Individual Educational Plans) specifying differing instructional strategies, five others with 501 plans (student with “special needs,” e.g., ADHD, who are otherwise not special ed) who came with their own individual plans, 10 kids who were 4 & 5 level (on the CELDT) ELL students requiring “sheltered instruction,” and 10 more, more or less, “average students.” For a teacher who used a great deal of “project based learning,” as I was, this required a great deal flexibility and planning. I hold credentials in History, English, ESL, and as a Reading Specialist. I have had several years of training in working with students with special needs. My situation was not at all unusual. * Full disclosure: The Special Ed Task Force, at least “theoretically,” came out of “recommendations” from a large group of “stakeholders” convened by the CTC to review credential needs and reforms. This was called the Teacher Advisory Panel (TAP). I was on the TAP. A number of my special ed people questioned how could all of this have “happened” and I don’t have a good answer. The TAP worked in sub-groups and I was not on the special ed sub-group; however, we as the greater group did review all recommendation before the final draft. No red flags went up for at that time. In, fact, going back to read the TAP recommendations red flags still don’t go up for me. It appears other concerned about special ed issues picked up that particular ball and really ran away with it. An excellent post, Gary, on critical SPED issues. Thank you. I have been trying to make sense of the “full inclusion at all costs” movement and without any success. My starting perspective is different that most, that of a father whose children were homeschooled K-12 in a relatively isolated rural setting, leading to exceptional academic and personal success for them. So I do not assume that students need to be embedded in a herd for academic or social success. That homeschooling journey began not too many years after Benjamin S. Bloom highlighted what has become known as “Bloom’s 2 Sigma Problem” in the journal, Education Researcher, in 1984. Unlike many relatively methodologically flawed studies in the educational realm, Bloom’s work involved interventional studies with random assignment of students to either a control group or the intervention. The control consisted of conventional classroom instruction and the intervention consisted of education solely through one-on-one (or 1 on 2 or 3) tutoring including differentiated mastery learning. The result observed by Bloom was that the average randomly assigned tutored student was two standard deviations above the control class in achievement, i.e. the average tutored student scored above 98% of the students randomly assigned to the conventional classroom for learning. Bloom explicitly recognized that learning principally through one-on-one tutoring, or something close to it, though extremely effective, was too costly for societies to bear on a large scale, and he sought to find other means to foster similar achievement. The implications for special education were obvious back then. While we might not be able to afford this sort of intervention for all students, we could afford something closer to learning through one-on-one tutoring for special education students whose disabilities, especially when moderate to severe, challenged their abilities to learn adequately in educationally inefficient but financially efficient general classrooms. The present movement for full inclusion for all, all the time, represents a stampede in the opposite direction of what was demonstrated to work by Bloom. We have seen the trend on these pages, and in the 2015 Special Education Task Force report. Every general ed teacher becomes a special ed teacher. Every special ed teacher becomes a general ed teacher. Since every teacher will be a special ed teacher, there will no longer be a shortage of special ed teachers. And we can pretend that every child with disabilities, no matter how severe, is being appropriately educated because the child will be in some proximity to a teacher who has some sort of SPED credentials. In practice, in real life, and with financial realities, when every teacher is a special ed teacher, no teacher will really be a SPED teacher. And no student, no matter how disabled, will really be receiving an appropriate individualized special education. Such students will simply be warehoused in cheap educationally inefficient general ed classrooms, with occasional proximity to some adult with supposed SPED training. Administrators will love full inclusion because it is relatively cheap, and SPED teachers can be spread very, very thin, doing relatively little, as even severely disabled students are mainstreamed. Yet another burden will be added to already abusively overworked general education teachers. The trend is idealistically and emotionally appealing to some. Some parents will be giddy because their severely disabled students are “learning with and like other normal kids”. If the parents don’t spend all day with their SPED kids in such classrooms, they will never really know what their kids are not getting in the way of proven evidence based individualized interventions. I have not seen unbiased and methodologically sound published research supporting this trend toward full inclusion for all, in contrast to the support that Bloom provided for the efficacy of highly individualized learning one-on-one or in extremely small groups. As I said about some folks concerned about special ed issues, “they really picked up the ball and ran with it.” So too, you have run pretty far to the dark side with some of the ideas I’ve expressed. I will say, some special ed folks do take a position that is pretty close to yours. 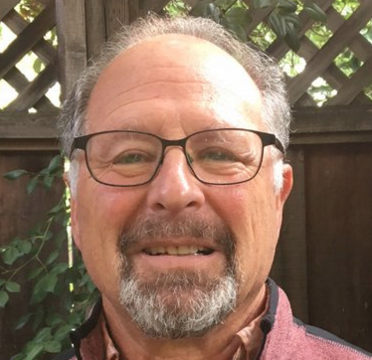 One of the mediating factors for me is the Carl Cohn, Prof of Ed–former Supt of Long Beach–former SBE member—contributor to this site–is (I believe) co-chair of this process and continues in retirement to be the SBE liaison with the Task Force. It has been my experience that Carl will proceed with the best interests of children in mind. Of course, these are “intentions,” and we all know where that can lead. Other people I have high confidence in, from the CDE and CTC, also participated in the process. My organization facilitated in getting a member put on the Task Force. The above being said, I have heard testimony that the “input process” for interested parties not a part of the Task Force, and noir called before the Task Force, was not as…shall we say..robust as it could have been. And that being said, I have also heard that some of the input that was offered is now reflected in the final draft of the Task Force report. The process was not perfect, but what is? I also said that the present configuration of special education has been in place for decades and, like other things, that can mean it (the configuration) needs to be trotted out and looked at. There are some realities that need to be addressed. Special ed is a very expensive service to provide and CA has among the worst education funding streams in the nation., meaning all school services are fiscally stretched very thin. And, again, the federal government has never really lived up to its obligation in the special ed arena. That creates a very tenuous balance point. Are there: 1) more fiscally efficient ways to provide services; 2) of like (or better) outcomes? Both parts of the question have high values. Interestingly, from some folks perspective, will be that two of the groups that will have the whole process under very close scrutiny will be the CTA and the CFT, the two teachers’ unions. As I also said, I have never seen (personally) an instance where the unions have put cost issues before quality service for special ed students issues. I don’t expect to see any change in that perspective. Thanks for highlighting the possible (impending?) raising standards-pedagogical changes needed divide. I agree that providing stability and directing resources are key. School Board meeting last night the Superintendent, before announcing all the wonderful initiatives he was creating, stated that California’s funding was 36 out of the 50 states. One view would be that what is happening under Local Control Funding Formula (LCFF) is robbing Peter to pay Paul. Only Peter is the middle class and upper class that holds sway with the State’s government. When the funding of inadequate resources becomes apparent to the powerful, those that have political power will flex their muscle and will end LCFF funding. Education government funding whether adequate or inadequate is mostly a zero sum game with powerful usually winning at the expense of the weak and powerless. The School Improvement Grants pumped funding into low performing school in much larger percentages and it was a dismal failure. What makes LCFF advocates believe that pumping smaller grants into schools will succeed? Opportunity gaps are now a global phenomena. This can be a useful perspective to remind all us Californians that we’re in the same boat. I think they’ve always been a global phenomenon, @Paul. Yes, it’s good to take the wide view from a historical perspective too.